Mangaluru, Dec 7,2015:Dakshina Kannada district bagged the overall championship in the State-level Pre University Athletics Meet 2015-16 held at Mangala Stadium from December 3 to 6. Both boys and girls from Dakshina Kannada won the team championships, the boys team winning 67 points and girls team winning 125 points. Bengaluru South, Udupi and Uttara Kannada districts won the second, third and fourth positions among boys teams, with 43, 23 and seven points respectively. Among the girls teams, Uttara Kannada, Bengaluru North and Udupi districts secured the second, third and fourth positions with 18, 16 and 13 points respectively. Devaiah T H, representing Bengaluru South district, won the individual championship among boys. He won the first places in 800 and 1500 metre races and third place in 400 metre race, securing a total of 11 points. Venissa Carol Quadros from Dakshina Kannada district emerged as the individual championship among girls. She has won first places in all three, 400, 800 metre race and 400 metre hurdles, with 15 points. The sports meet also witnessed several records retained and broken. In the 200-metre race, Manish from Udupi district, broke his own record from last year, by completing the race in 21.5 seconds. He had completed the race last year in 22 seconds. Anil Kumar, representing Dakshina Kannada, broke the record of M C Desai of Gadag, by completing the 3000-metre race in 9:19.7 seconds. The old meet record was 09:36.0 seconds. Amaranath Dukkarwadakar of Belagavi created a new record in the 110-metre hurdles by completing the event in 14.06 seconds. The old meet record was 15.10 second, set by Sandeep Kumar S of Bengaluru South. 4X100m Relay: New Meet Record: Manish, Mithun Shetty, Milan Gourav R, Hassan A, Udupi (43.50 Sec) Old Meet Record: Mohammed Sadath, Gourish, Nagendra, Rohith, Santhosh, D.K (44.00 Second). 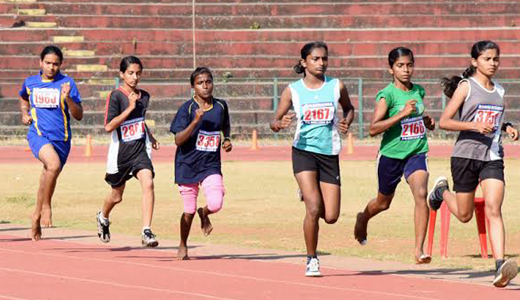 Simi N S from Dakshina Kannada broke her own meet record by completing the 100-metre race in 12.20 seconds, while the old meet record in her name was at 12.50 seconds. She has also broken the record of Vijayakumari G H from Bengaluru North in the 200-metre race. The new meet record is 25.5 second as against the old one, which was 25.8 second. Another athlete Venissa Carol Quadros, representing Dakshina Kannada district, broke her own record in the 400-metre race, and also broke the record created by Mamatha K C from Moodbidri. In the 400-metre race, the new meet record set by Quadros is 58.1 second while the old meet record was 58.3 second. In the 800-metre race, the new meet record is 02:16.7 second and the old meet record was 02:20.4 second. Race Walk, (3 km): Arpitha H S from DK 16:13.20 second. She has broken the record of Vilma D’Souza of Dakshina Kannada 16:37.68 second. Girls are equal to boys in all the field. Girls have a great dedication towards their achievement.